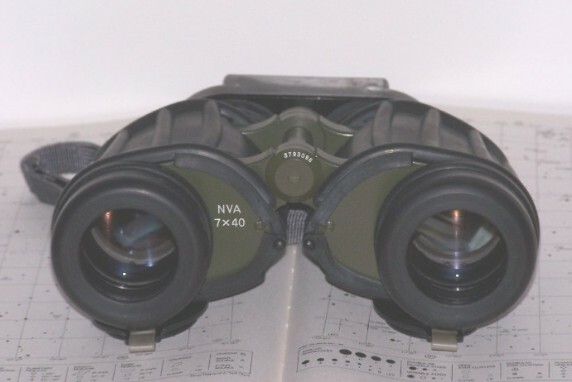 Intrigued by descriptions and reviews by Dr. Holger Merlitz on his fine site, I decided to pop for a pair of these fine binoculars. I wanted a pair of good, rugged binoculars that I could use during the day for general purpose viewing, and at night for wide-field observing, particularly of the summer Milky Way. After watching the posts on a certain auction site, I was finally able to acquire a pair of nearly new CZJ DF binos. The DF version differs from the EDF model mainly in that the DF binos are a porro prism design and the later EDF are roof prism. The main advantage of the EDF version is that it is smaller and lighter, otherwise they are both fine glasses. Out of the box, my first impression of the DF was that these are VERY solidly constructed field glasses, intended for use under rough conditions. They are metal-bodied, heavily armored with a sheath of thick rubber, water proof, and possess IR detection capability; a feature that I will not use very often! 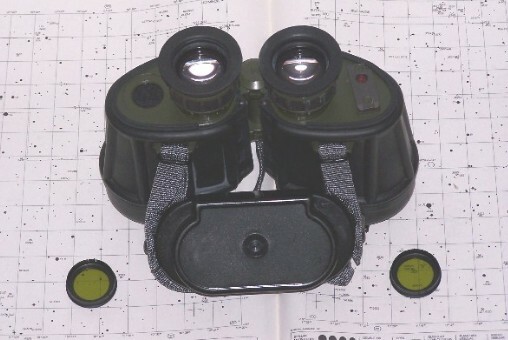 The oculars focus individually, the objectives have tight fitting plastic flip-down covers, and contained in the eyepiece cover are a pair of amber filters. A strong grey strap finishes it off, adding to its no-nonsense, military image. 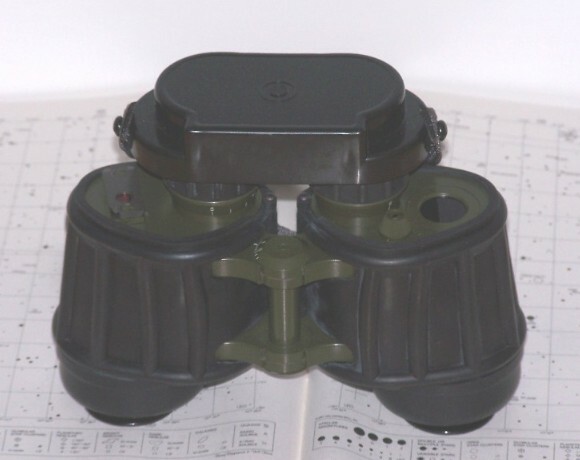 Using the specs on Dr. Merlitz's home page, these binoculars weigh in at 1.3 kg; about 2.8 lbs. Altogether, a substantial and imposing pair of field glasses! The objective lenses have deep coatings of a reddish-purple hue. The eyepieces show evidence of coating, although not to the same degree as the objectives, and the right eyepiece has a reticle. Holding the binoculars up, the circles that seem to hover over the oculars are perfectly round until I slowly *BLEEEP* the glasses until they almost disappear. At this point the circles begin to lose part of the upper edge. Eye relief, according to Dr. Merlitz, is 20mm and fov is 8.5°. Eager to try them out, I stepped outside and scanned the neighborhood. Once focused, the on-axis images were sharp and clean, and suffused by a pale yellow color. The color is much less intrusive than the strong yellow of the Russian BPO 7x30 binos, but it is very apparent in the DFs, nontheless. I felt that the color would not be of too much concern to me, but I think a birder might find it annoying. Using the reticle scale as a yardstick, I noted that the image began to soften slowly at, or slightly more than, 50% of the distance from the center of the fov. Even so, the image held up well until nearly the very edge, at which point it quickly dropped off. This also isn't a problem for me because I wear glasses, and the very edge of the image is hidden from me unless I mash my glasses against the soft rubber eye guards. I also noticed that the image reveals a decent depth of field. I felt that, for daytime use, these would do fine for many purposes, but where color fidelity is important, some may take exception to the light yellow color. Night time use is a different story, however. Taking the DFs out after midnight, I was immediately struck by the dimness of the views of the Milky Way. I admit I am accustomed to 10x50 and 12x50 hand-held binos, and the views are much brighter through them, but the smaller objectives of the CZJ 7x40 binos made their presence felt. Once this feeling passed, I went hunting for some of the brighter objects in the vicinity of Sagittarius. I easily found M22, M8, and M20, as well as M6 and M7. M4 was apparent in Scorpius, too. I split Mizar and Alcor, of course, but Mizar itself remained intact. The wide fov made it possible to view all three stars making up the spout of Sagittarius' teapot and all four stars of the teapot's handle could be framed in the fov, too. The two stars composing the teapot's base were barely out my fov, however. Also, the stars at the edges were noticably soft, conforming to what I had seen during the day. Even so, the stars were pin points near the center, and the yellow color that was so noticable during the day was barely apparent in the darkness. Finally, the DF's weight became an issue as the evening wore on. I think I will find these binoculars very servicable during daylight hours, but less so during the night. The Carl Zeiss Jena NVA DF binoculars are well made and sturdy field glasses. Optically, they are fine glasses, although the slight yellow shading in the eyepiece will be objectionable to some observers. As daytime binoculars, they are very worthwhile, but they are somewhat less successful during the night time. I will keep these for now, and I will likely get quite a bit of enjoyment from them, but care should be taken for those who are interested in these field glasses to make sure they will satisfy your needs. "The two stars composing the teapot's base were barely out my fov, however." I should mention that I meant that I couldn't quite fit both stars in the same fov. Thanks for the review, Walter. I added it to the list of mini-reviews at the top of this forum. I will second what mike has said excellent review and of great use to me as i am looking for a decent pair of bins and these may just be the ticket! Thanks for the kind words, Mike and James! I like these glasses a lot, and I think they make fine general purpose binoculars. Those look REALLY solid binoculars,Walter. I bet if a tank rolled over them,the tank would come off worst. Belated thanks and appreciation for a very informative review Walter ! I can't for the life of me think why I didn't say as much in June 2005 , when I first read the posts ! Thanks Steve and Kenny! It's been quite a while since I've last read this review. I still have the "Checkpoint Charlie" binocular and it continues to meet my needs for coastal viewing and camping. While I haven't tried the tracked vehicle test yet, this is a very solid and well made binocular. Overall, it is a good optical instrument and fun to take on trips. "fun to take on trips" especialy if you come across any tanks. That's probably when you were on holiday on the Isle of Wight, watching Lesser and Great Black-backed gulls on the high cliffs of the Needles. On another holiday, you apparently missed my post about Laura Erickson's article reconciling her birding w/ her brother's hunting. On that same thread, another member posted a link to her photo gallery, which you recently "rediscovered". Thanks for that review, I've been curious about these binoculars. I read an article somewhere that described how to take out the reticle. I think I would probably find it distracting like my "floaters" on a bright day. It's binoculars like the 8x32 Ultima that fall off SHARPLY at 50% that I find disturbing, particularly when panning when my leading eye will see out of focus images as I scan in the direction of the pan while my other eye lags behind and sees a sharp image. Ugly, ugly, ugly! Wish Nikon had put rubber armoring like the NVA's on the E2s, including the rubber objective guards! Did you review the Checkpoint Charlie bins on the forums? I don't see a review on CN/CD mini-review sections. Brock he is looking at the Sun and they are filters. :-)Brock I could try running over the Fujinon with my tractor if you want me to.I to missed Walter's fine review of his CZJ 7x40 NVA.I must of been of vacation on Stone Mountain. You missed Walter's review, too? As Master Archivist, I think Kenny should provide CN/CD members with a weekly binoforum digest in case we missed something important. Anyone second that motion? I'm humbled by the warm responses to an old report on old binoculars! I am so inspired by your collective reaction to these fine cold-war era glasses I may start cruising eBay to find an appropriate tank (a T35, perhaps) with which to properly perform Steve's test...if my wife will allow it. Thanks to all for your kind words!